Today is Meskel. What’s Meskel? It’s an Ethiopian religious festival celebrating the discovery of the “true cross” in the fourth century. They celebrate by dancing, feasting and lighting huge bonfires. According to the Ethiopian legend, when people get close to the piece of the True Cross it made them naked by its powerful light. Because of this, a decision was made to bury it at the mountain of Gishen Mariam monastery in Wollo region. It’s a big event in Ethiopia and if you search Twitter for “Meskel” you’ll get a taste for how people celebrate. 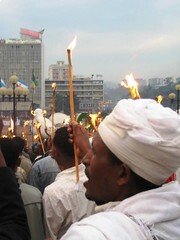 There are indeed massive bonfires, good food and not all the celebrations are in Ethiopia. We’re celebrating with the Mudula Mamas—three moms of children born in Mudula, Ethiopia, who are running a triathlon this weekend—by raising money for clean water through Mudula Water. Today we’re doing a Meskel Match. If we can raise $1,500 today we’ll match it. Will you help us celebrate Meskel and donate? Update: We’ve raised more than $1,800 today and scored the $1,500 match. That’s more than $3,000 for clean water in one day! And that puts us that much closer to scoring the extra $8,000 from Janus. Thanks for your support and continue to cheer the Mudula Mamas on. They race on Sunday and will keep raising support through Saturday at noon. Melkam Meskel!